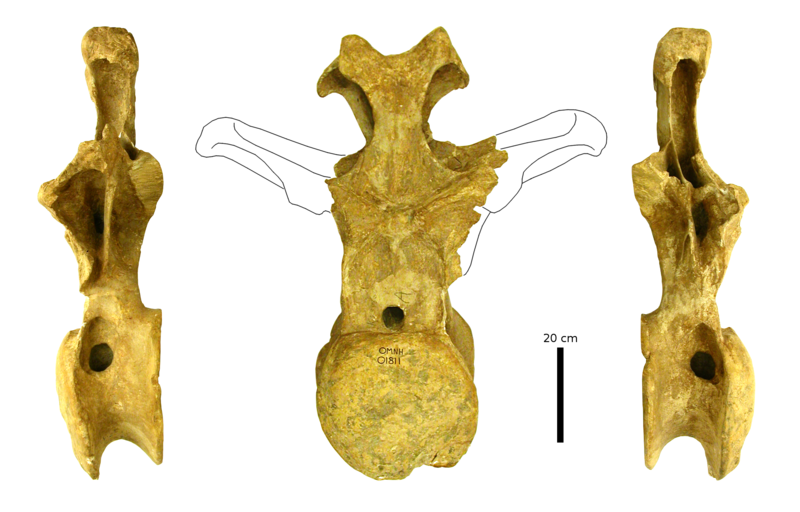 Hey, look, a new sauropod vertebra to kick off the new year! I’ve blogged a lot about the giant – and tiny – apatosaurines from the Morrison Formation of Oklahoma, and just once on Saurophaganax. But otherwise I don’t think I’ve covered any of the other Oklahoma Morrison dinos. So here’s a start: a pretty decent Camarasaurus dorsal. Broken transverse processes traced from Osborn and Mook (1921). Like all of the Oklahoma Morrison dinos, it’s from the quarries on or near Black Mesa, at the far northwestern corner of the Oklahoma panhandle. Based on the narrowness of the neural arch and spine, I don’t think this vert can be any farther forward than D6 – anterior Cam dorsals are w-i-d-e. It would be odd for a camarasaur to have a spine split that deeply as far back as D10 or D11 (see Wedel and Taylor 2013). The centrum is very anteriorposteriorly short, which is a posterior dorsal character, but based on Osborn and Mook (1921) the centra can be this short as far forward as D6. So on the balance of the evidence, I think it’s probably a D6 or D7. But that is just an estimate, which might be off by a couple of positions either way. Tons more that could be said about this specimen, but I’m going to play against type and not write a dissertation for a change. So, here’s OMNH 1811. We’ll probably come back to it at some point. Osborn, H.F. and Mook, C.C. 1921. Camarasaurus, Amphicoelias, and other sauropods of Cope. Memoirs of the American Museum of Natural History 3:247-287. Wedel, Mathew J., and Michael P. Taylor. 2013. Neural spine bifurcation in sauropod dinosaurs of the Morrison Formation: ontogenetic and phylogenetic implications. Palarch’s Journal of Vertebrate Palaeontology 10(1):1-34. ISSN 1567-2158. Dude, you couldn’t have taken 30 seconds to colour-balance that baby? I did color balance it. That’s the color the specimen is. If I went any further, I’d be introducing false information. But feel free to have a whack at it. The specimen is bright yellow? Surely that is an artifact of the lighting in the collection room. Anyway, here’s a light re-balancing, which I think makes it easier to see the morphology. Yeah, the stuff from Kenton tends to be grey out the outside, yellow on the inside. And it was mostly prepped back in 1930s by WPA guys armed with chisels, penknives, and sandpaper, so not much of the grey cortical bone survived. See for example OMNH 1331 – the room lights are not coloring it yellow, or the ethofoam it’s resting on would also be yellow-tinted. I agree that your rendition punches up some aspects of the morphology, but it looks lurid to me. Nice vortigaunt, er, I mean, vertebra! Matt is right in the Homestead Quarry post cranial material is colored yellow, despite the lithology is gun metal and grey in color of the bentonitic clays.